Background Little is known about the perioperative course of patients with Parkinson's disease (PD) undergoing cardiac surgery. The objective of this study was to identify the influence of PD on the perioperative course and to improve treatment. Methods Perioperative data were analyzed retrospectively from 130 patients undergoing cardiac surgery between September 2001 and April 2013 who had PD and were compared using 1:1 matched-pair analysis with 130 controls not affected by PD. Results The 30-day all-cause mortality (4.6 vs. 9.2%; p = 0.21; odds ratio [OR] = 0.45; 95% confidence interval [CI]: 0.16, 1.31) and the overall all-cause mortality (27.7 vs. 28.5%; hazard ratio [HR] = 0.96 [0.56, 1.66]; p = 1.00) were not significantly different between PD patients and the control group. Emergency surgery (p = 0.04; OR = 3.20; 95% CI: 1.06, 9.66) and postoperative pneumonia (p < 0.001; OR = 11.3; 95% CI: 3.06, 41.6) were associated with 30-day mortality. Independent predictors of all-cause mortality were age at surgery (p = 0.01; OR = 3.58; 95% CI: 1.38, 9.30), NYHA (New York Heart Association) classification stage IV (p = 0.02; OR = 17.3; 95% CI: 1.52, 198), and postoperative pneumonia (p = 0.05; OR = 46.4; 95% CI: 0.97, 2219). We did not observe an association of PD with short- or long-term all-cause mortality after adjustment for associated covariates. 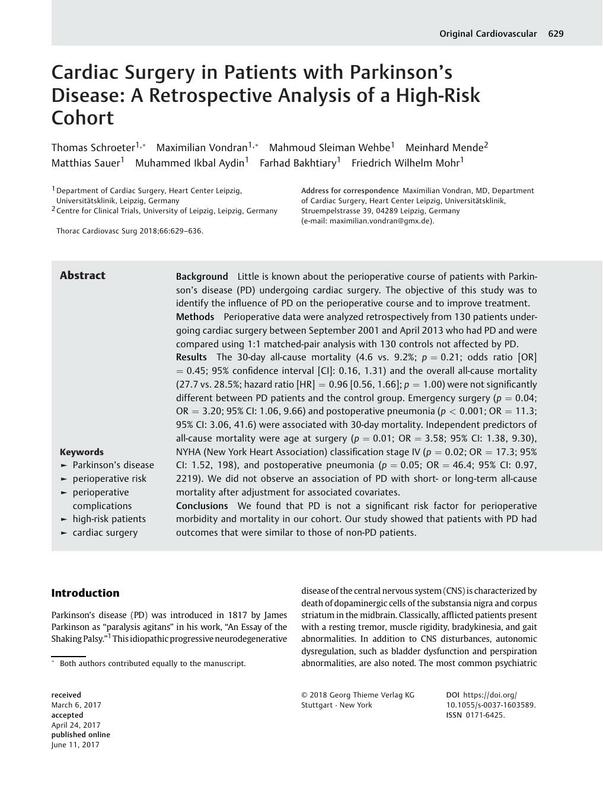 Conclusions We found that PD is not a significant risk factor for perioperative morbidity and mortality in our cohort. Our study showed that patients with PD had outcomes that were similar to those of non-PD patients. Presented at the 28th EACTS Annual Meeting 2014 in Milan, Italy. * Both authors contributed equally to the manuscript.